Have you ever heard of the term chicken lice? It makes your skin crawl and your head itch a little doesn’t it? Though chicken lice aren’t the kind which lives in human hair, they can cause many problems for your flock. Therefore, it’s important to understand what chicken lice are, how to prevent it, what signs to look for with an infestation of your flock, and how to treat chicken lice within your flock. I’m going to fill you in on all of the information you need to know to keep your flock healthy and happy. If you’ve ever had a run-in with human lice, chicken lice will most likely sound all too familiar to you. Keep in mind; chicken lice only live on chickens. They may jump on you or your clothing, but they can’t feed on you which means they’ll die. In short, chicken lice are small, flat insects. They have six legs and move quickly around the host. Like human lice, they lay their eggs at the base of the chicken’s feathers, and the adults live on the skin of the chicken. The good news is the lifecycle of chicken lice is relatively short. The bad news is they’re continually reproducing. A chicken louse will hatch in the feathers of a chicken around four to five days after the egg was laid. It takes about nine to 12 days to reach maturity. From there, an adult louse will live for another 12 days. If the louse is female, she’ll take those 12 days to lay more eggs and continue her legacy on your host chicken. It’s important to understand the lifecycle of chicken lice and what you’re looking for to know how to spot a lice infestation in your flock. If your chickens have a lice infestation, it’s important to understand what causes it and what doesn’t cause it. First, you need to know lice are a part of your birds living in nature. It isn’t because your coop wasn’t clean enough, or you did anything wrong in particular. Second, know what could bring potential lice to your flock. Since your birds live in nature, it isn’t uncommon for them to come in contact with other animals. Realize chicken lice can be carried by wild birds and rodents which roam around your yard and your coop while you’re sleeping at night. Since you understand where lice can come from, how can you prevent it? We do what we can as chicken keepers to keep wildlife away from our chickens as it is because everything likes the taste of chicken. But it’s important to make sure the chickens’ feed is placed in a secure area where wildlife won’t be drawn in to feed on their food. Also, consider placing netting over your chickens’ yard area to keep them safe and also from allowing birds to land in your chickens’ area. If they can’t invade where your birds roam, they can’t get close enough to share their lice. Dust baths are what help treat your chickens’ skin. This is what will rub any nits out of their feathers and make them an undesirable host for lice to want to live on. 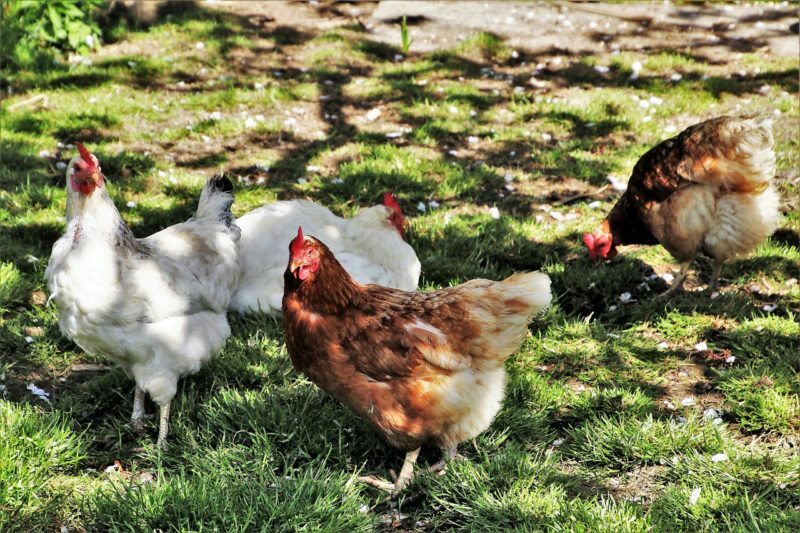 With this in mind, be sure to give your chickens a dust bath area. You should include sand, diatomaceous earth, and wood ash (if possible) in their dust baths. These items are what deter and kill lice. The more frequently your birds can roll around in it, the better off they’ll be. I told you not to beat yourself up if your birds have an infestation of lice. You shouldn’t automatically assume it’s because your coop wasn’t clean enough. However, this doesn’t mean you shouldn’t pride yourself on keeping a tidy coop because you should. Your chickens’ health depends upon it. If you find lice on a chicken, chances are your other birds have it, and they’re living in your coop. This is why it’s important to be sure you clean your coop adequately and regularly to deter any parasites from making your chickens’ home, their home. When you purchase new birds, don’t introduce them to your flock right away. You want to assume every bird you bring home will be healthy, but there are no guarantees. This doesn’t mean someone tried to deceive you. It could mean your bird wasn’t showing many (if any) signs of illness, but the bird is still sick or infested. However, if you quarantine your new birds for three to four weeks before introducing them to your flock, you’ll have time to watch and inspect the new birds. If you see signs of illness or infestation, you should treat them and make sure they’re 100% better before introducing them to your flock. Be sure you inspect your flock every month or two to see if they are showing signs of any parasites. Simply run your fingers over each bird to see if you notice any nits or bugs on your birds’ feathers or skin. If you don’t see any, your flock is good. If you see signs of parasites, you’ll need to treat the entire flock because parasites travel quickly. Finally, if you have broody hens, keep a close eye on them. They don’t get up, and dust bathes as regularly as they usually would if they weren’t trying to hatch eggs. Because of this, they’re more susceptible to having parasites. You’ll need to keep an eye on them and treat them as needed if you find parasites on your broody hens. You’re doing all you can to prevent lice from treating your chickens as hosts. Yet, you begin seeing changes in your flock and aren’t sure if it’s chicken lice or if another situation is going on. If you see any of these signs, you should act quickly to treat your flock. Parasites can make your chickens miserable and in some cases even cause death. The sooner you act, the better off your flock will be, and the faster they will return to happy, laying chickens. We’ve covered what chicken lice are, how to prevent them, and the signs to look for to recognize an infestation. Some chicken keepers think the only way to treat chicken lice is with over the counter meds. I haven’t had an infestation I couldn’t lick with proper cleaning techniques and diatomaceous earth. However, this doesn’t mean other chicken keepers haven’t come across this bad of an infestation. Therefore, it’s important to understand there are over the counter medicines you can use to treat chicken lice and if you’re more comfortable with this method, you should know what’s available. If your flock is infested with chicken lice, you can use dog flea shampoos or dog flea dips. Don’t use medicine meant for humans because it won’t impact this particular type of lice and could harm your chickens. Also, you can use garden and poultry dust. This is a great way to kill any pest or parasite you don’t want around your flock. Most treatments should take four weeks and be done one time per week to kill off any newly hatched nits. There are some chicken keeps which prefer to keep things more DIY and natural when possible. There’s nothing wrong with this method either. I’ll be upfront; some people don’t like to use diatomaceous earth around their chickens because they’re afraid of it harming their delicate respiratory systems. If you use DE around your birds, be wise with it. You should place diatomaceous earth and wood ash in their dusting bath and let your birds apply it to themselves unless the infestation is terrible. In those cases, it’s best to hold the chicken and gently apply DE to their skin and stirring up as little dust as possible. You’ll also want to be sure to thoroughly clean the coop, remove all bedding, and dust everything with diatomaceous earth. Don’t reapply bedding or anything to the floor of the coop for an hour. Don’t allow your chickens back in the coop for two hours after you’ve applied this treatment to protect them from any flying dust particles which might impact their respiratory systems. Again, be sure to apply this treatment once a week for four weeks. Keep inspecting your birds each week at treatment time to see if the parasites’ numbers are decreasing. Also, check out our info on Chicken Mites and molting, to know what else to look for. Well, you are now in the know about chicken lice. You know how to spot them, what they do, how to prevent chicken lice, and how to treat an infestation. Hopefully, this will spare you and your chickens any unnecessary hardships. We’d love to hear from you. How do you treat chicken lice? Has any method worked particularly well for you?